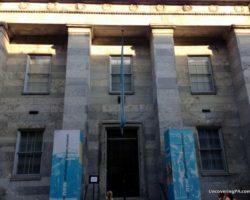 During my travels in Pennsylvania, I visit and write about many great things to do. However, I also stay at some fabulous hotels and eat at some great restaurants. Some I find on sites like Yelp, while others are recommended to me by the local visitor bureaus. 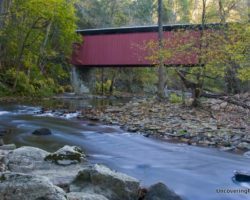 During my three visits to Bucks County, I’ve definitely come across several places that I think are worth mentioning to anyone heading to the area. 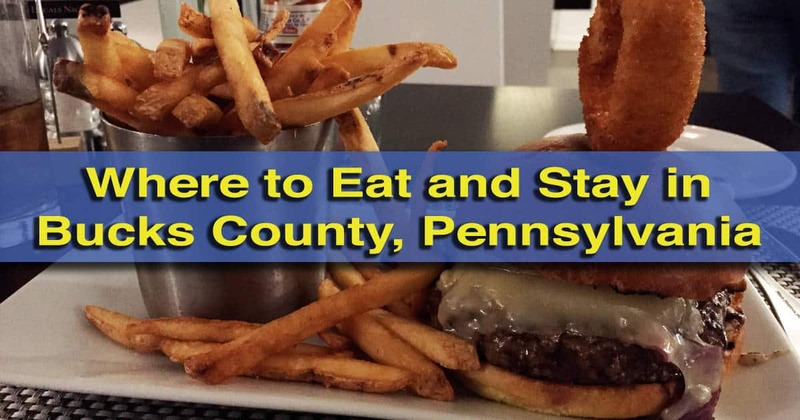 While this is certainly not a definitive list of great places to stay or eat at in Bucks County, these are some places that I have enjoyed for one reason or another. Whether you are visiting the are to explore the great art at the Moravian Pottery and the Michener Museum, see the interesting history at the Mercer Museum, or exploring the countryside on a covered bridge tour, you’ll definitely need somewhere to eat and stay while you are in the area. 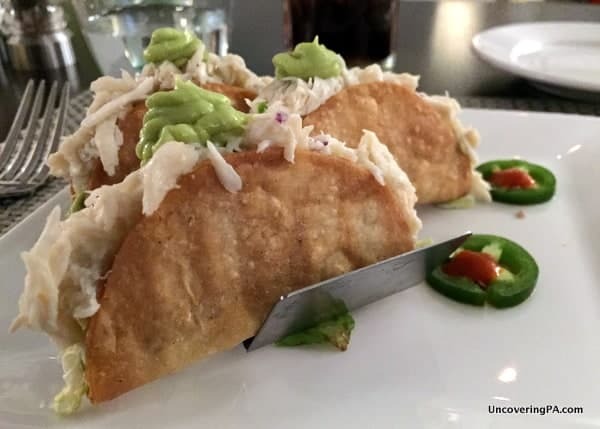 The crab tacos at Caleb’s American Kitchen are quite delicious. 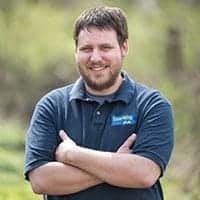 I put Caleb’s American Kitchen first on this list because it’s easily one of the best places that I’ve eaten in Pennsylvania. Seriously. Located halfway between Doylestown and New Hope, Caleb’s American Kitchen could be easily overlooked by visitors driving along the busy roads near Peddler’s Village in Lahaska. However, to do so would be a huge mistake. The decor and ambiance at Caleb’s strikes a perfect balance between sophisticated and casual. In fact, I would feel equally comfortable here in shorts or a tie. 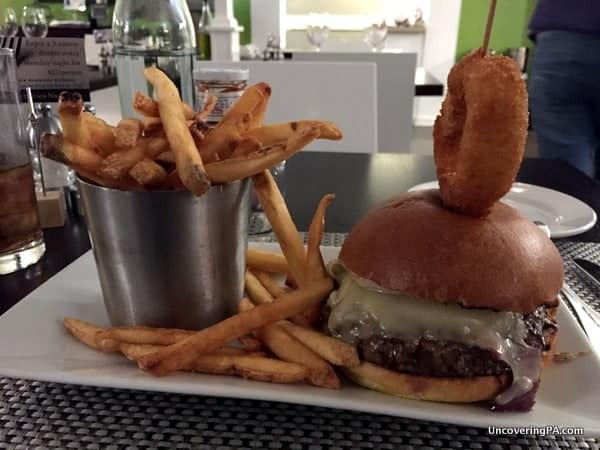 Even better, the menu strikes the same balance, with high-end appetizers and entrees on the menu alongside delicious hamburgers. The burgers at Caleb’s American Kitchen are some of the best I’ve ever eaten. When I visited, I tried their Lump Maryland Crab Mini Tacos, the CAK Signature Burger, and ice cream from a local creamery. While the crab tacos could have used a bit of spice, the burger was easily one of the best I’ve ever eaten and the ice cream was fantastic. Caleb’s American Kitchen has tons of great specials and is open for breakfast, lunch, and dinner. Note that they are B.Y.O.B. and only offer burgers Sunday-Thursday. 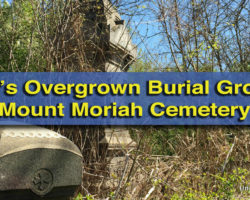 For more information, check out their website. 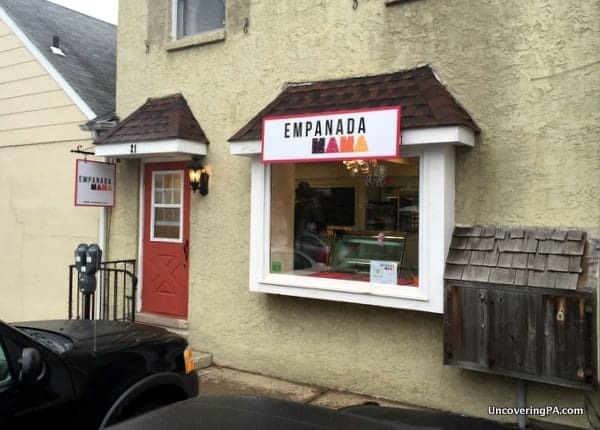 Empanada Mama is the perfect lunch stop in downtown Doylestown. Hidden on a backstreet in downtown Doylestown is one of the coolest places in town to grab a quick lunch: Empanada Mama. The bright shop feels like it was plucked out of a large South American city and dropped into the Philadelphia Suburbs. Owner Kendall Bejak spent six years in South America, and knows her way around an empanada. Empanada Mama is a bit hard to find, but worth the effort. The choices, which change daily, range from traditional to locally-inspired favorites. When I visited, I went with the owner’s recommendations and tried the Korean Beef, Barbecue Pork, and Thai Chicken Curry. And, I loved them all. Truthfully, if I lived anywhere near Doylestown, Empanada Mama would definitely be a regular lunch stop for me. 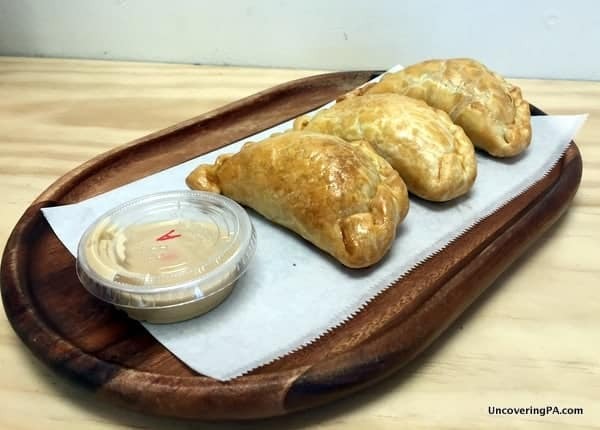 For more information about Empanada Mama and their daily menu, check out their website. Located in an office complex on the outskirts of New Hope is Triumph Brewing Company. Based in Princeton, New Jersey, their New Hope location is their second and features a full line-up of their craft beers. I visited during happy hour, and was delighted with their drink prices, and the taste of my IPA. Because I just stopped for a quick beer on their deck, I didn’t have a chance to try their food. While the menu looks good, it looks like they get some pretty mixed reviews on Yelp. However, if you’re looking for a quick place for a drink, the craft beers at Triumph Brewing Company are a great choice. More information about visiting can be found on Triumph’s website. M.O.M.’s in downtown Doylestown is a popular brunch spot, but I enjoyed the ambiance more than the food. M.O.M.’s, which is short for Maxwell’s on Main, is one of the most popular brunch spots in downtown Doylestown. Featuring a bit of Southern and New Orleans flair, M.O.M.’s definitely delivers with amazing ambiance. I visited for brunch on a recent Sunday to find the restaurant busy and a jazz band playing in the corner. While I often dread the thought of live music while I’m trying to eat, the band was great, and the volume was low enough that you didn’t have to shout across the table. Truthfully, the food itself was a bit bland, but came out quickly and in a nice size portion. However, their beer list was amazing, and the mimosa I order with brunch was definitely not weak. 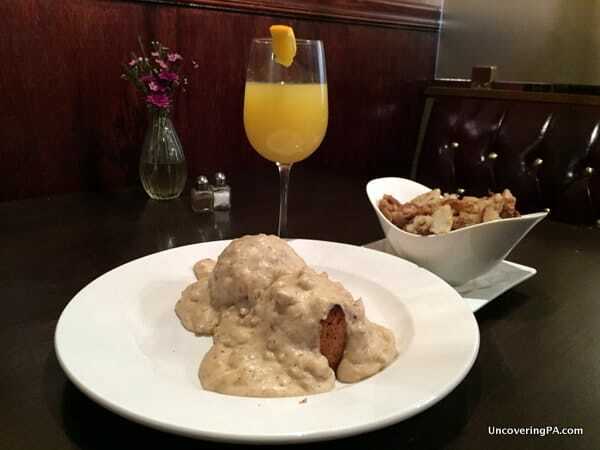 I would be inclined to give M.O.M.’s another try if I was in the area, but I would likely order something other than the sausage gravy and biscuits as that may not be their strong suit. Either way, I would definitely go back again to try a couple beers from their great list and to listen to the wonderful live jazz. For more information about visiting Maxwell’s on Main, check out their website. C’Est La Vie French Bakery in New Hope, Pennsylvania offers a fabulous selection of French pastries. I stumped upon C’Est La Vie while looking for somewhere to get a snack in New Hope. This tiny bakery is tucked behind several other buildings near the bridge to Lambertville, NJ. Serving dozens of amazing looking pastries, this is exactly what I remember the French bakeries in Paris to be like. I’m actually glad I don’t live near C’Est La Vie as I would probably eat way too many of their delicious desserts. 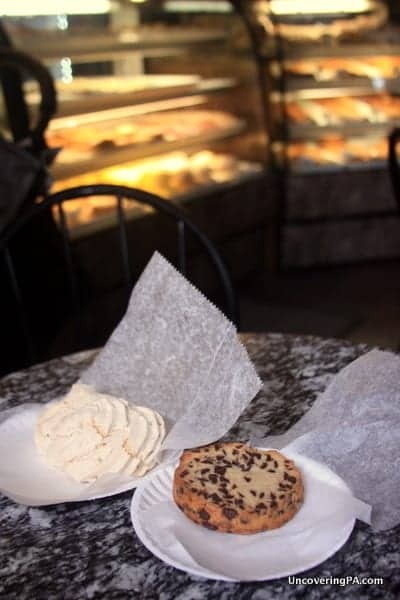 If you’re looking for a sweet snack in New Hope, you can’t go wrong with C’Est La Vie. They don’t seem to have a website, so check out their Yelp page for more information. If bed and breakfasts aren’t your style, but you’re still looking for something comfortable, Homewood Suites in Doylestown is a great choice. In addition to all of the standard hotel amenities, my two-room suite had a small kitchen with a full-size refrigerator and stove, perfect for a late-night snack or those that want to save a bit of money by cooking. The hotel also had a nice pool and several good sitting areas in the lobby for those looking to get out of their rooms for a bit. Even better, there is a decent hot breakfast each morning and free dinner Monday-Thursday nights. For more information about Homewood Suites in Doylestown (affiliate link) or read guest reviews on TripAdvisor (affiliate link). 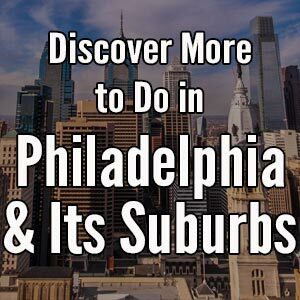 Bucks County has a lot of bed and breakfasts, especially around New Hope. During a recent visit, I had the chance to stay at Pineapple Hill Inn Bed and Breakfast, currently the number one rated B&B in New Hope, according to Trip Advisor (affiliate link). 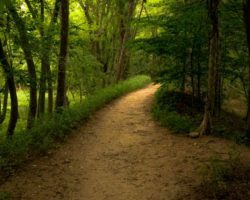 Located closer to Washington Crossing than New Hope, this is a perfect spot for those visiting Washington Crossing Historic Park, but makes a great jumping off spot for anyone wanting to explore the New Hope area. The 9 rooms and suites in the home are furnished in your typical bed and breakfast style, and while nice, aren’t a reason to pick Pineapple Hill. However, the beautiful grounds and pool are definitely a great reason to pick this B&B. The top reason to visit, however, has to be the breakfast and the hospitality of the innkeepers, Scott and Roy. I’m not a huge fan of breakfast food, but I would stay here again just for the delicious breakfast and the amazing coffee. It was easily one of the best breakfasts I’ve eaten anywhere. For more information about staying at Pineapple Hill Inn Bed and Breakfast, check out their website. You might also like our favorite cheesesteaks in Philly and the best breweries in the city. Note: My visits to Caleb’s American Kitchen, M.O.M.’s, Empanada Mama, and both hotels were hosted by Visit Bucks County, Visit Philly, or the establishment. However, the opinions expressed in the article are my own. I’m wondering if you have ever, visited Bristol Borough Pa.? One of the oldest towns in Pa. Founded in 1681!!! We have an **HISTORIC BRISTOL DAY** every Oct. I see that you really like Bucks County!